Massachusetts Teachers Association president Barbara Madeloni at a rally to protest proposed budget cuts at UMass Boston. 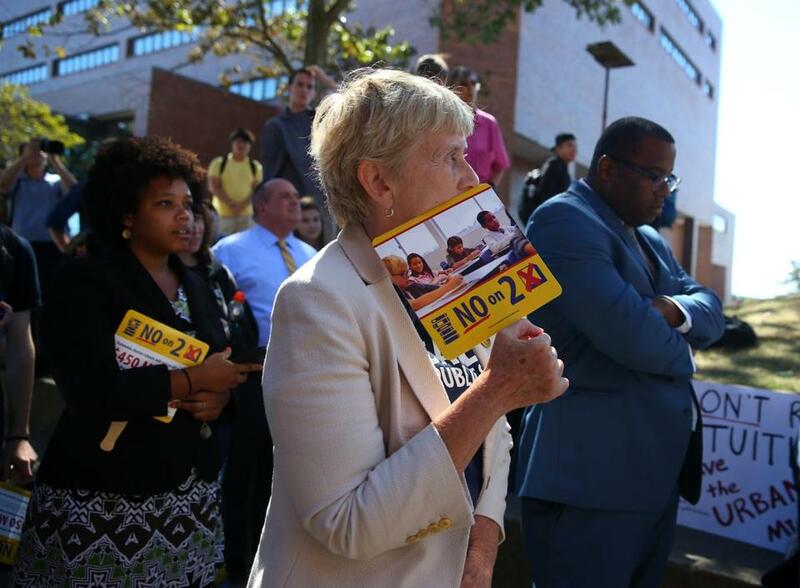 FRESH OFF A victory on Question 2, the Massachusetts Teachers Association, led by combative firebrand Barbara Madeloni, is pushing legislation to undermine key pillars of this state’s highly successful education-improvement effort. The MTA’s main bill takes aim at so-called high-stakes testing, under which students have at least five opportunities to pass the MCAS graduation exam. Even as it calls for hundreds of millions more in state education spending, the MTA wants a three-year moratorium on those tests, with the goal of nixing them entirely. The bill would also rewrite school-turnaround legislation, dramatically limiting the powers that the law gives districts and the state to intervene with underperforming schools. And it would also prohibit districts from using student learning, growth, or achievement data in teacher evaluations. Meanwhile, the MTA is stepping up its “opt-out” push, an effort to persuade parents to keep their children from taking the statewide tests. No surprise there. Teachers unions have long had an ambivalent stance on education reform, supportive of the additional resources but leery of the accompanying accountability. Still, a move to eliminate statewide standardized testing ignores the history of educational improvement in Massachusetts. Our best-in-the-nation status was achieved in large part because of the landmark education reform law of 1993, which married a big new infusion of resources to statewide standards and assessments. The 2010 follow-up law, meanwhile, gave the districts and state important new powers to intervene with underperforming schools. Statewide tests have been an instrumental part of that improvement effort. Anti-testing partisans often assert that a student’s socioeconomic status is determinative of his or her academic performance, and that real improvement can’t be made unless poverty is eradicated. But the Massachusetts experience belies that contention. Since the advent of the MCAS, districts have been able to pinpoint and focus on students’ weaknesses and needs, improve instruction and tutoring, and dramatically boost passing and proficiency levels. Those test results have also led to a concerted focus on lagging urban schools. “This bill begins to dismantle in large steps that framework, and that to me would be a tremendous mistake for the Commonwealth,” says Education Commissioner Mitchell Chester. Yes it would, which makes it unfortunate that the legislation has attracted more than 100 cosponsors. Given that even Rush doesn’t exhibit a clear grasp of how the MTA’s legislation would change the school-turnaround process, it’s hard to think that most of his cosponsors do. These lawmakers need to undertake some serious homework about exactly how Massachusetts made it to the top nationally on education. As for the opt-out: On its website, the MTA describes it as “the right of parents to opt their children out of state standardized tests” and makes it sound as though doing so carries no consequences, at least for non-high-school students. But there is no right to opt out; the tests are mandatory. And because school evaluations are based on a broad cross section of students, a school whose participation rate falls significantly could see itself drop a performance level. That happened with both Boston Latin School and the Roger Clap School in Dorchester last year. Further, parents miss a chance to see how their child is doing according to a uniform state standard. The MTA’s legislation is self-interested and wrong-headed, but not particularly surprising, at least not in the Madeloni era. It deserves to die a quiet death in committee. Encouraging families to opt their kids out of testing, on the other hand, is irresponsible, an attempt to use parents and students as pawns in the union’s anti-testing crusade. The MTA should know better than to lead families down that counterproductive path.